Δελτίο τύπου: «Carbide was formed in Detroit, Michigan on the city’s east side in 1981. J.D. Von Doring is an original member with Neeko joining him shortly after. Later in 1990 Mark Gastmeier joined the band. The band up to that time had 2 guitarists. Through years of many members’ changes the band was most stable as a three piece. So they remained. This really strong band delivered US Power/Thrash Metal serving the powerful sound and helping to plant the seeds of thrash! 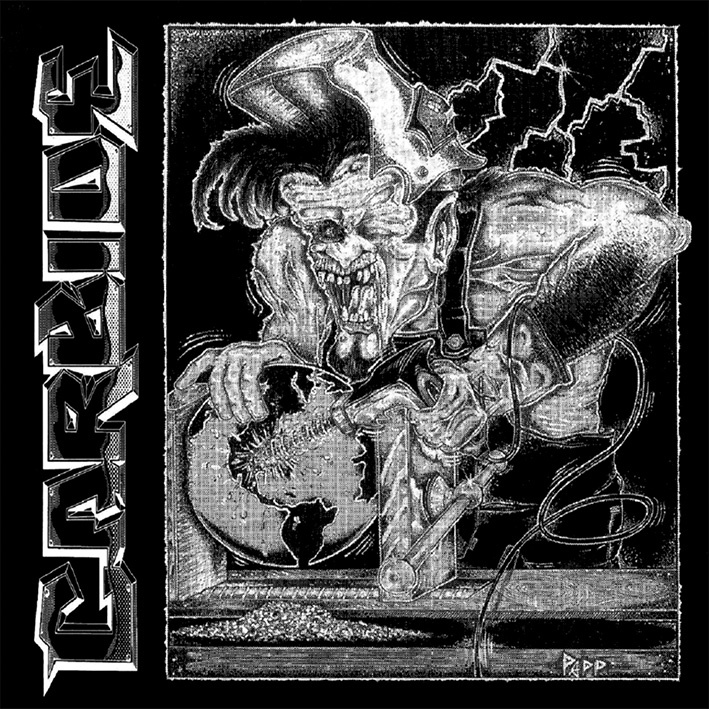 In 1994 Carbide hit the studio to record the ‘Spiral Termination’ CD. This private release produced to only 1000 copies on CD. Between recording sessions of ‘Spiral Termination’ Carbide continued writing songs and started another recording project named the “Crazy Eights” (4 songs), being recorded on 8-tracks in a basement. There was a cassette sampler released prior to ‘Spiral Termination’ which included 2 songs from each recording project. Rest two songs from “Crazy Eights” never were released! Arkeyn Steel Records signs a deal with Carbide to reissue “Spiral Termination” + bonus the 4 songs of “Crazy Eights” demo. This great reissue comes in 12-page glossy booklet with lyrics, bio and full of unreleased pics, cover with original artwork and remastered from DAT tapes! Carbide can combine US Power metal and speed/thrash metal genres in their music.